Erected on the ruins of the keep of Sendai Castle (or Aoba Castle), the Shochuhi memorial was erected in 1902 to commemorate the fallen from the Imperial Army’s 2nd Division, which was located in Sendai. The Shochuhi memorial is currently under the care of Gokoku Shrine, Miyagi Prefecture. As was previously reported (Jan. and June, 2012), the black kite in bronze that sat atop the memorial’s stone pedestal fell as a result of the Great East Japan Earthquake. With its Secretariat in the National Research Institute for Cultural Properties, Tokyo, the Committee to Rescue Cultural Properties Damaged by the Tohoku Earthquake and Tsunami worked to rescue the memorial as a cultural property. Bronze fragments that were scattered around and atop the pedestal were previously collected. The bronzed black kite had been left as it was for a prolonged period, but it was finally moved this February. Work started on February 4 and was supervised by Bronze Studios and Sekiho, which have previously worked to restore outdoor sculptures. A 4.5×4 m bed of steel plates was placed on the ground in front of the east side of the Shochuhi memorial. On February 7, a 25-t all-terrain crane lifted the bronzed black kite and placed it atop the bed of steel plates. A covering was then fashioned from corrugated plastic panels, and all work was completed on February 9. Snow occasionally fell during the work but was cleared. Luckily, lifting of the bronzed black kite was marked by good weather on the 7th; lifting proceeded as relevant personnel and members of the local media looked on. Movement will allow inspection inside the broken neck of the black kite statue. The head of the statue was found to be joined to the body by a mortise-and-tenon joint and an inscription was found to read “Head joined October 4, 1902/At the Tokyo Fine Art School/ In Commemoration of this Date.” Such discoveries are important to the study of the Shochuhi memorial. 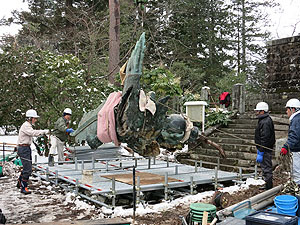 Like previous work to rescue the Shochuhi memorial, movement of the bronzed black kite was carried out thanks to donations to the Institute from Kaikai Kiki Co., Ltd. (President: MURAKAMI Takashi) to help with the Cultural Property Rescue Program. Movement of the bronzed black kite under cover will prevent damage to broken areas by rain for the time being. Nevertheless, the bronzed black kite was damaged extensively by the fall, e.g. its left wing broke off, so it is far from its majestic visage prior to the disaster. Other threats have yet to be dealt with, such as bronze adornments atop the pedestal falling off and complete collapse of the pedestal due to penetration by rainwater. Future steps must be taken to conserve this rare memorial from the Meiji Era. On February 26, OTANI Shogo (Senior researcher, National Museum of Modern Art, Tokyo) delivered a presentation entitled “AI-MITSU’s Landscape with an Eye” at a seminar of the Department of Art Research, Archives, and Information Systems. The work’s creator, AI-MITSU (born: ISHIMURA Nichiro, 1907–46), left behind a body of work through his unique sense of shapes and steadfast use of oil paints. As a painter, AI-MITSU is an essential part of Japan’s history of Western-style painting from the 1930s to 40s. 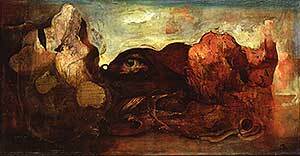 Among his numerous works, Landscape with an Eye is not merely a result of surrealism in modern Japanese art; rather, the piece is renowned for its unique depiction of the fantastic amidst darkening times. The Department of Art Research, Archives, and Information Systems previously conducted optical studies with the National Museum of Modern Art, Tokyo through a research project on Research on the Use of High-Resolution Digital Images and Comprehensive Research on Modern and Contemporary Art in January and April 2010. Full-scale color images and near-infrared reflectance images from those studies will be exhibited on the second floor of the Institute. A participant in the optical study of AI-MITSU’s Landscape with an Eye, OTANI presented the results of his research, which builds on study and discussion of the images obtained. 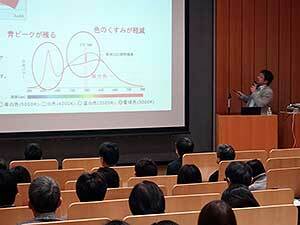 OTANI’s presentation brought up several issues. Although AI-MITSU’s work is generally considered to be typical of surrealist painting in Japan, numerous questions remain, e.g. what specific impact did the work have and what was AI-MITSU trying to depict? Near-infrared reflectance imaging and near-infrared transmittance imaging were done, allowing a glimpse into the process AI-MITSU used to produce the work. 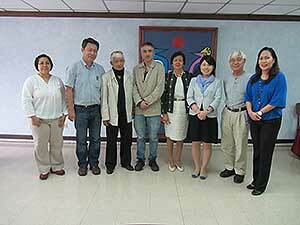 The comprehensive presentation discussed a single work from multiple perspectives. It reviewed the work in terms of the motivation behind its creation and its motifs and depictions in light of the imaging information and it confirmed the work’s place in art history via remarks on and assessments of the work thus far. The fourth workshop, a “Training Workshop on Conservation of Archaeological Objects and Documentation of Excavated Objects,” was held jointly with the Institute of History and Cultural Heritage, the National Academy of Sciences, Kyrgyz Republic from February 8 to 14, 2013. A total of eight young Kyrgyz trainees participated in the workshop. During the workshop, trainees received practical training in “pottery reconstruction,” “metal conservation,” and “pottery drawing” using archaeological objects that were excavated during the 3rd workshop in the summer of 2012. The Japan Center for International Cooperation in Conservation plans to conduct various workshops to protect cultural heritage in Central Asia next year as well. The Japan Consortium for International Cooperation in Cultural Heritage surveyed the cultural heritage of Myanmar from February 14th to the 25th. 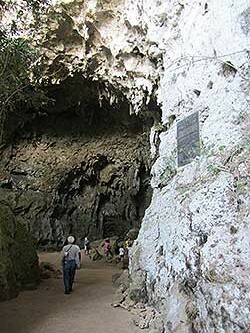 The main goal of the survey was to explore current and future developments in international cooperation to preserve cultural heritage in the Philippines by visiting sites firsthand and determining the Philippines’ specific requirements for cooperative efforts. 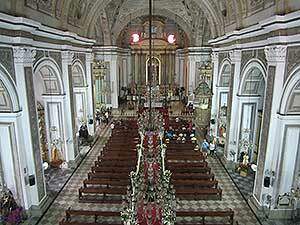 Sites such as churches and houses from the Spanish colonial period as well as prehistoric shell mounds and rock art were visited along with museums and libraries. Survey members gathered information and interviewed relevant personnel. Results of the survey indicated that the public needs to be increasingly aware of the need to protect many historic buildings and archaeological sites as cultural heritage. That said, educational institutions involved in protecting cultural heritage are lagging, so personnel need to be promptly trained. Cooperation with local authorities is a key aspect of protecting cultural heritage, and provision of that protection depends on local politics. Interviews indicated that the Philippines wishes Japan to help foster academic cooperation between the countries and train Filipino personnel with an eye toward increased public awareness of cultural heritage and cooperation in Asia. Japan needs to capitalize on its previous cooperative efforts in Asia and provide support with an eye toward cooperation with other Asian countries. Such steps are essential to determining ways to protect the cultural heritage of the Philippines. The year 2013 is the 40th Year of ASEAN-Japan Friendship and Cooperation, and Japan is expected to cooperate more with the region. In order to explore the nature of cooperation Japan can provide with regard to preserving cultural heritage, plans are to determine what support Japan can provide while continuing to gather information and coordinate with relevant institutions.